"Arizal" redirects here. For the Indonesian film director, see Arizal (director). Isaac (ben Solomon) Luria Ashkenazi (1534 – July 25, 1572) (Hebrew: יִצְחָק בן שלמה לוּרְיָא אשכנזי‎ Yitzhak Ben Sh'lomo Lurya Ashkenazi), commonly known as "Ha'ARI" (meaning "The Lion"), "Ha'ARI Hakadosh" [the holy ARI] or "ARIZaL" [the ARI, Of Blessed Memory (Zikhrono Livrakha)], was a foremost rabbi and Jewish mystic in the community of Safed in the Galilee region of Ottoman Syria. He is considered the father of contemporary Kabbalah, his teachings being referred to as Lurianic Kabbalah. While his direct literary contribution to the Kabbalistic school of Safed was extremely minute (he wrote only a few poems), his spiritual fame led to their veneration and the acceptance of his authority. The works of his disciples compiled his oral teachings into writing. 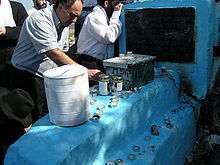 Every custom of the Ari was scrutinized, and many were accepted, even against previous practice. Luria died at Safed on July 25, 1572 and is buried at the Old Jewish Cemetery, Safed. The Ari Ashkenazi Synagogue, located in Safed, Israel, was built in memory of Luria during the late 16th century. Luria was born in 1534 in Jerusalem in what is now the Old Yishuv Court Museum to an Ashkenazi father, Solomon, and a Sephardic mother. Sefer HaKavanot U'Ma'aseh Nissim records that one day Luria's father remained in the Beth kneset alone, studying, when Eliyahu HaNavi appeared to him and said, "I have been sent to you by the Almighty to bring you tidings that your holy wife shall conceive and bear a child, and that you must call him Yitzchak. He shall begin to deliver Israel from the Klipot [husks, forces of evil]. Through him, numerous souls will receive their tikkun. He is also destined to reveal many hidden mysteries in the Torah and to expound on the Zohar. His fame will spread throughout the world. Take care therefore that you not circumcise him before I come to be the Sandak [who holds the child during the Brit Milah ceremony]." While still a child, Luria lost his father, and was brought up by his rich maternal uncle Mordechai Frances, a tax-farmer out of Cairo, Egypt. His uncle placed him under the best Jewish teachers, including the leading rabbinic scholar David ibn Zimra. Luria showed himself a diligent student of rabbinical literature and under the guidance of another uncle, Rabbi Bezalel Ashkenazi (best known as the author of Shittah Mekubetzet), he became proficient in that branch of Jewish learning. At the age of fifteen, he married a cousin and, being amply provided for financially, he was able to continue his studies. Though he initially may have pursued a career in business, he soon turned to asceticism and mysticism. Around the age of twenty-two he became engrossed in the study of the Zohar (a major work of the Kabbalah that had recently been printed for the first time) and adopted the life of a recluse. Retreating to the banks of the Nile for seven years, he secluded himself in an isolated cottage, giving himself up entirely to meditation. He visited his family only on Shabbat. But even at home, he would not utter a word, even to his wife. When it was absolutely necessary for him to say something, he would say it in the fewest number of words possible, and then, only in Hebrew. Ark in the Ari Ashkenazi Synagogue. While Luria, the "Lion", gave the complete traditional system of Kabbalah. Maimonides, Judaism's greatest Rationalist, is called the "Great Eagle", both images taken from the Merkabah vision of Ezekiel. In 1569, Luria moved back to Eretz Israel; and after a short sojourn in Jerusalem, where his new kabbalistic system seems to have met with little success, he settled in Safed. Safed over the previous decades had become a center for cabalistic studies, led by Rabbi Moses Cordovero. There is evidence that Luria also regarded Cordovero as his teacher. Joseph Sambari (1640–1703), an important Egyptian chronicler, testified that Cordovero was "the Ari's teacher for a very short time." Luria probably arrived in early 1570, and Cordovero died on June 27 that year (the 23d day of Tammuz). Bereft of their most prominent authority and teacher, the community looked for new guidance, and Luria helped fill Cordovero's former role. Soon Luria had two classes of disciples: novices, to whom he expounded the elementary Kabbalah, and initiates, who became the repositories of his secret teachings and his formulas of invocation and conjuration. The most renowned of the initiates was Rabbi Hayyim Vital, who, according to his master, possessed a soul which had not been soiled by Adam's sin. With him Luria visited the grave of Rabbi Shimon bar Yochai and those of other eminent teachers; it is said that these graves were unmarked (the identity of each grave was unknown), but through the guidance given by Elijah each grave was recognized. Luria's kabbalistic circle gradually widened and became a separate congregation, in which his mystic doctrines were supreme, influencing all the religious ceremonies. On Shabbat, Luria dressed himself in white and wore a fourfold garment to signify the four letters of the Ineffable Name. Many Jews who had been exiled from Spain following the Edict of Expulsion believed they were in the time of trial that would precede the appearance of the Messiah in Galilee. Those who moved to Israel in anticipation of this event found a great deal of comfort in Luria’s teachings, due to his theme of exile. Although he did not write down his teachings, they were published by his followers and by 1650 his ideas were known by Jews throughout Europe. Luria used to deliver his lectures extemporaneously and did not write much, with a few exceptions, including some kabbalistic poems in Aramaic for the Shabbat table. The real exponent of his kabbalistic system was Rabbi Hayyim Vital. 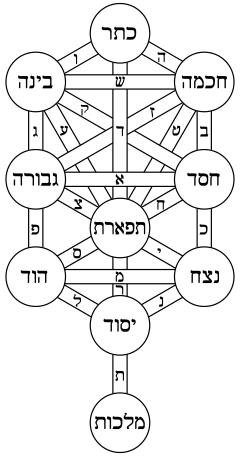 He collected all the notes of the lectures which Luria's disciples had made; and from these notes were produced numerous works, the most important of which was the Etz Chayim, ("Tree of Life"), in eight volumes (see below). At first this circulated in manuscript copies; and each of Luria's disciples had to pledge himself, under pain of excommunication, not to allow a copy to be made for a foreign country; so that for a time all the manuscripts remained in Israel. At last, however, one was brought to Europe and was published at Zolkiev in 1772 by Isaac Satanow. In this work are expounded both the theoretical and the devotional, meditative teachings of Lurianic Kabbalah based on the Zohar. ↑ Derived from the acronym for "Elohi Rabbi Itzhak", the Godly Rabbi Isaac or "Adoneinu Rabbeinu Isaac" (our master, our rabbi, Isaac). ↑ Eisen, Yosef (2004). Miraculous journey : a complete history of the Jewish people from creation to the present (Rev. ed.). Southfield, Mich.: Targum/Feldheim. p. 213. ISBN 1568713231. 1 2 3 "Isaac ben Solomon Ashkenazi Luria (ARI)". JewishEncyclopedia.com. Retrieved 2016-07-24. Fine, Lawrence (2003). Rodrigue, Aron; Zipperstein, Steven J, eds. Physician of the Soul, Healer of the Cosmos: Isaac Luria and His Kabbalistic Fellowship. Stanford, CA: Stanford University Press. p. 480. ISBN 0-8047-4826-8. Retrieved 2010-08-16. Joseph ben Isaac Sambari (1994) [1-23-1673]. Sefer Divrei Yosef. Jerusalem: Ben Zvi Institute. Chisholm, Hugh, ed. (1911). "Luria, Isaac ben Solomon". Encyclopædia Britannica (11th ed.). Cambridge University Press.